Watch me cook this on YouTube, click here. Arroz Verde, which means green rice, is a vibrant, richly coloured dish that always makes a statement! I have a very good Mexican friend here and we love nothing better than to spend time in each other’s kitchen, cooking and learning! I first cooked this in her kitchen some 10 years or so ago! 600 ml chicken or vegetable stock (fresh/stockpot/cube), no nasty stuff added, please! 1. 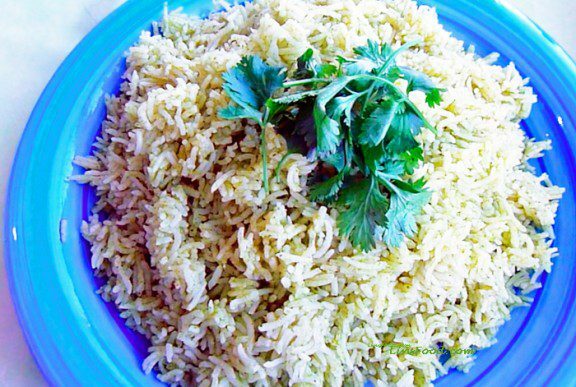 Rinse the rice in cold water and drain. 2. Blend the onion, garlic, chilli and capsicum with a little of the stock until you have a green paste. 3. Heat the oil in a large saucepan on medium heat and add the rice, sauteing for a couple of minutes, until the rice looks grainy and translucent. 4. Add the green paste, stirring to coat the rice. 5. Add the stock and bring to a boil, then simmer until the liquid has almost all been absorbed. you’ll be able to see tiny hole in the rice at this point. 6. Put the lid on and cook for another 10 minutes. Turn the heat off, take the lid off, drape a tea towel over and put the lid back on snugly. Move to a cool hob and leave to cook in its own steam. After 10 minutes or so, fluff up the rice. Season to taste, ie for salt and sprinkle some freshly ground black pepper over. If you have a rice cooker, place all the ingredients from the word “Go” and have a glass of wine! Fantastic served with all manner of side dishes like Tex Mex Chilli con Carne, refried beans, etc.